I normally stay away from either making or eating truffles. I don’t like all the rolling-by-hand. So when I saw this idea on a Mexican cooking show recently, I was motivated to put this knew technique into action. 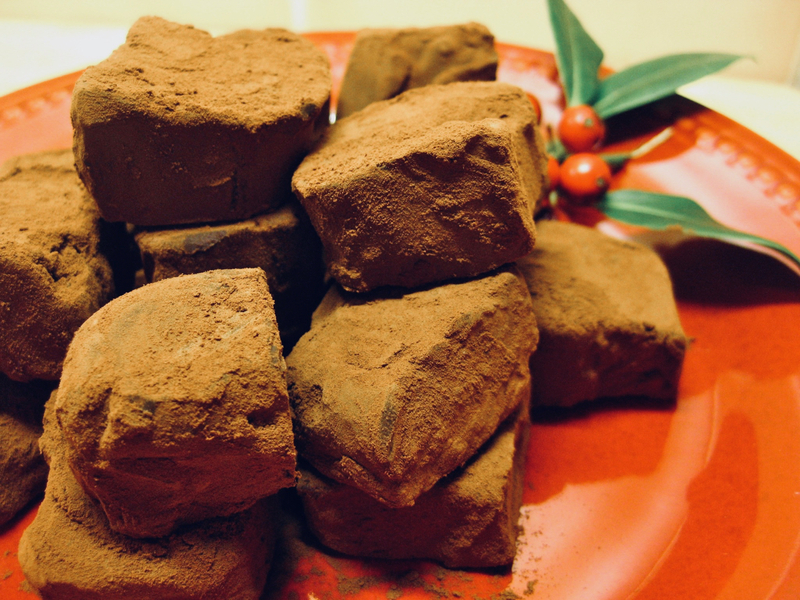 Instead of rolling your truffles, simply pour the mixture into a tin and cut the pieces into rustic cubes. Dust in cocoa as you have truffles without all the fussles. When it comes to making truffles, as long as you’ve got equal parts of chocolate and cream you can pretty much do what you like with them. I feel the marriage of walnuts and chocolate is highly underrated, so I use chopped and roasted walnuts and walnut liquer. I use a Croatian brand of liqueur called Maraska and the walnut liqueur called Orahovac, made from green walnuts. In the UK, you can get a bottle of this at Gerry’s Wine and Spirits . But you could easily use roasted almonds and Amaretto or hazelnuts and Frangelico. Pinch of salt, about 1/8 – 1/4 tsp. Taste and use your own judgement as to how much you’d like to use. The salt shouldn’t actually be a detectable flavour, but rather a foil to the sweetness of the chocolate. In a glass bowl, put cream, chopped chocolate and salt. Microwave on LOW for a minute at a time, or until the cream gets hot but not boiling. Stir until the chocolate starts to melt. The idea is to melt the chocolate in the ambient heat of the cream. Once it has started melting well, then keep heating but only for 30 seconds at a time. You don’t want it to boil or burn. Pour in the liqueur and nuts and give it a good stir. Line a plastic container with baking paper (to make for easy removal of the truffle slab) and pour in the chocolate mixture. Let the mixture set overnight or you’ll find it too soft to handle. Slice into cube type shapes and then coat with cocoa in a zip lock bag. This gets really messy so don’t do anything while you’re doing this step – or you’ll have cocoa from kingdom-come to breakfast-time. For a little sparkle, add some edible lustre dust to the cocoa, which you can pick up at most large grocery stores.